Lets say you don’t have a GoTek drive or Compact Flash card, how on Earth do you transfer data between your Amiga and a PC? In the days before the GoTek there was another go-to tool for transferring data between an Amiga and PC: Amiga Explorer by Cloanto. 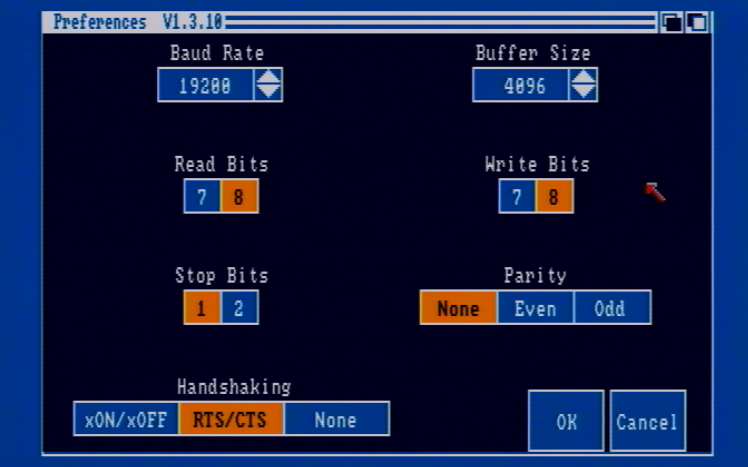 Using this application it was possible to transfer not only data between the systems but also create Amiga Disk Format (ADF) images from Amiga floppies, apply ADF images to Amiga floppies, and even copy the Amiga Kickstart ROM. 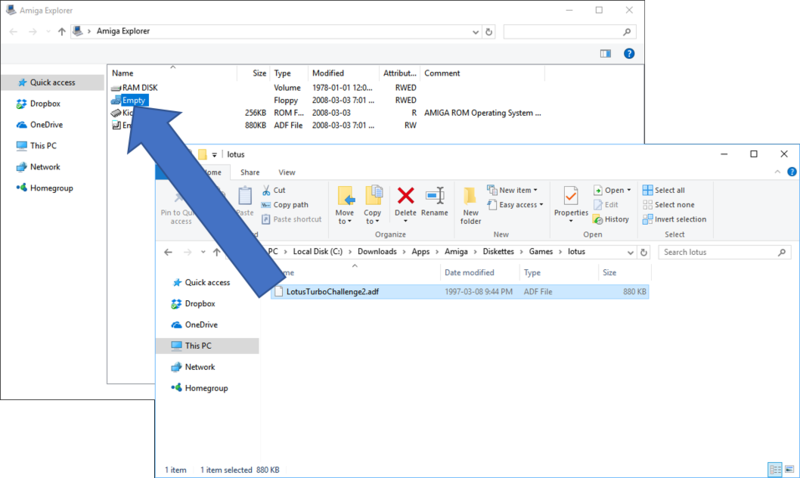 In this article I’ll run you through how to install and use Amiga Explorer with a standard Amiga 500 (512MB of RAM) connected to a Windows 10 PC using a null-modem cable over the serial ports of each system. 1. 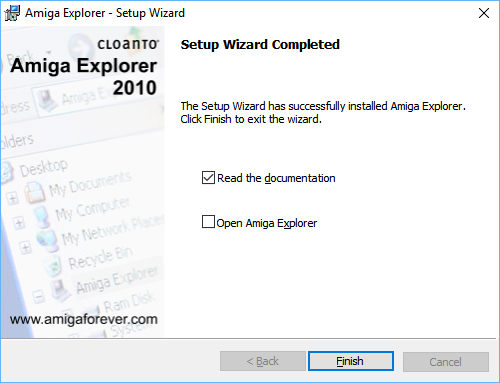 Download the Amiga Explorer installation file from the Cloanto website (https://www.amigaforever.com/ae/). 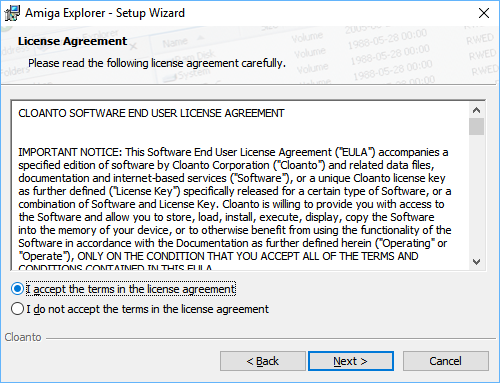 NOTE: Amiga Explorer is Shareware and Cloanto provides it at no cost. If you wish to help support them it’s recommended that you purchase it, or purchase an Amiga Forever Plus or Premium Edition which include the Amiga Explorer application. 2. 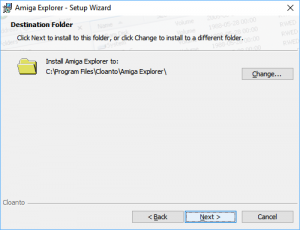 Double-click on the Amiga Explorer installation file. 3. 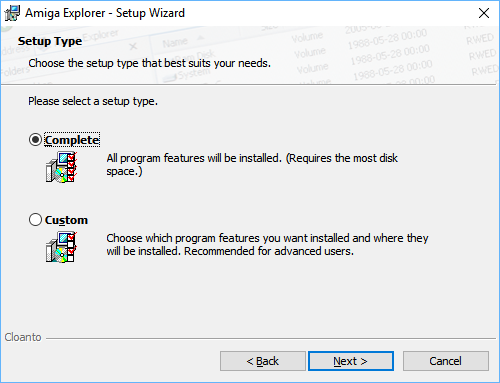 On the Amiga Explorer Setup Wizard window, click on the Next > button. 4. 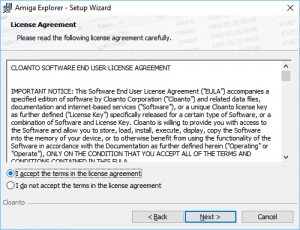 Accept the license agreement by choosing the “I accept the terms in the license agreement” option and click on the Next > button. 5. 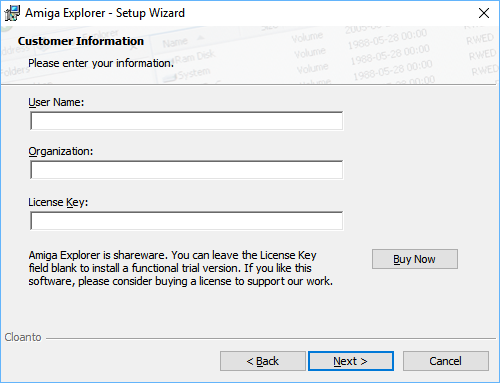 Fill in the customer information and license key (if you have one) and click on the Next > button. 6. Choose whether you wish to perform a Complete or Custom installation. For this example a Complete installation will be performed. Then click on the Next > button. 7. 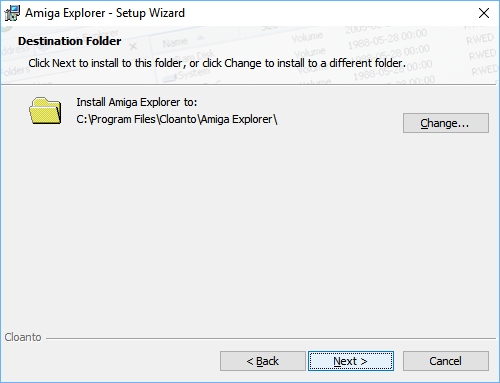 Choose the destination folder to install the Amiga Explorer application and then click on the Next > button. 8. Finally the installation is ready to start. Click on the Install button. 9. The installation will then start. 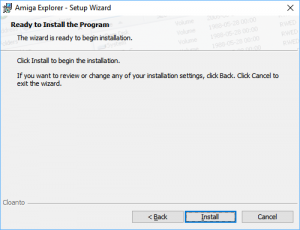 You may be prompted by Windows UAC to allow the installation to start. 10. 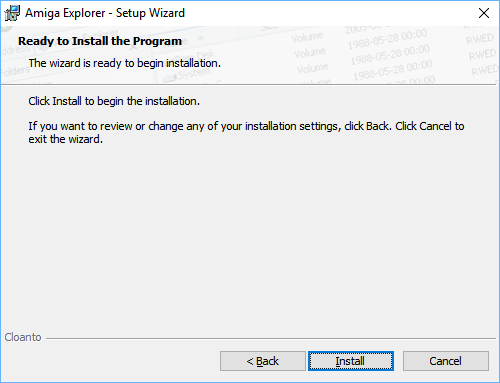 Once the installation is completed, click on the Finish button and this will close the Setup Wizard. On the Windows desktop will be an Amiga Explorer icon. 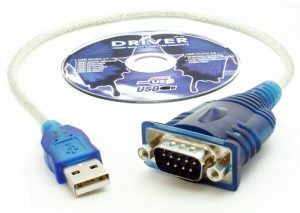 A serial null-modem cable is required to connect the Amiga to the PC. If you choose to purchase a null-modem cable it’s critically important that the cable is wired for “full handshaking”. Alternatively you can choose to make your own cable. 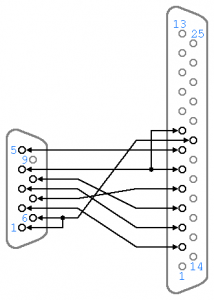 Cloanto has done a great job at documenting the pin-out of the serial null-modem cable on their website (https://www.amigaforever.com/kb/13-105) which is required to connect the Amiga to the PC. 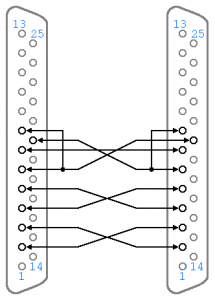 Below are the pin-outs for the serial null-modem cable shown on the Cloanto website. For this document, a DB-9 (female) to DB-25 (female) cable was constructed. 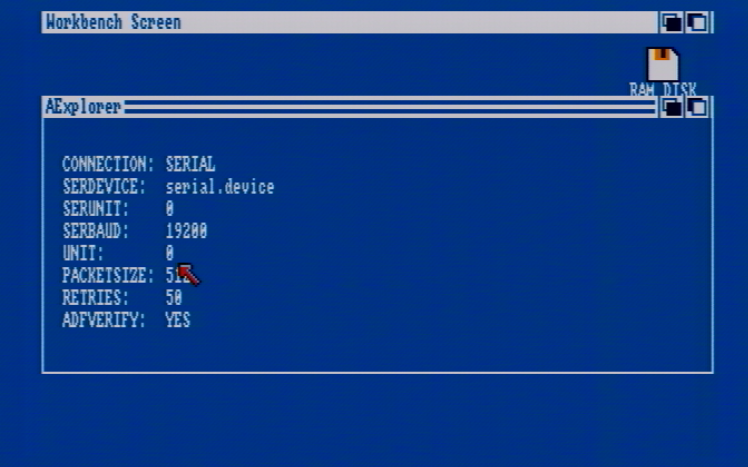 NOTE: Many modern PC’s don’t have serial ports anymore. USB serial port adapters will work just fine. For this document, a Prolific USB-to-Serial Comm Port adapter, similar to the one shown below, was used. 1. 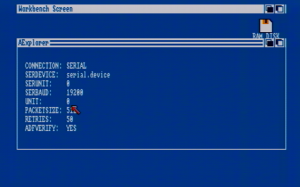 Connect the serial ports of the Amiga and PC together using the null-modem cable. WARNING! BE SURE YOU ARE CONNECTING THE SERIAL PORTS TOGETHER! 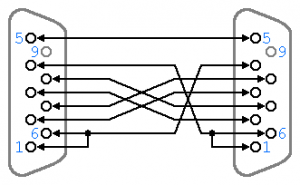 ACCIDENTALLY CONNECTING TO A PARALLEL PORT MAY DAMAGE ONE OR BOTH COMPUTERS. 2. 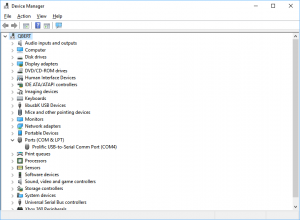 Open the Windows Device Manager to find out what COM# your PC’s serial port is. 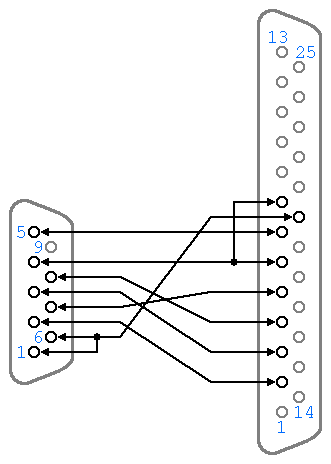 In this example COM4 is the PC’s serial port. 3. Turn on the Amiga and boot Workbench. Workbench version 1.2 or higher is needed. 4. 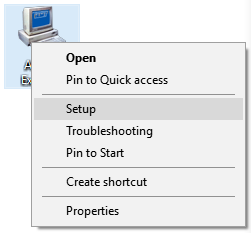 Once Workbench is up and running, right-click on the Amiga Explorer icon on your Windows PC and choose the Setup option from the pop-up menu. 5. 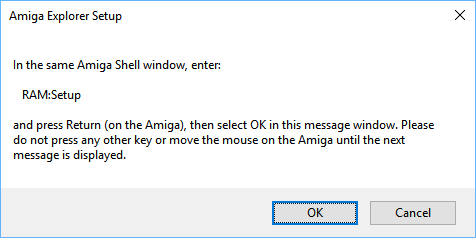 Click on the OK button of the Amiga Explorer Setup dialog. 6. On the Workbench version confirmation dialog, click on Yes button if the Amiga is running Workbench 2.0 or higher, or click on the No button if the Amiga is running Workbench 1.2 or 1.3. 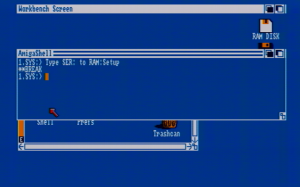 In this example the Amiga is running Workbench 1.3, so No was clicked. 7. 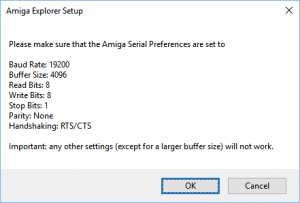 The next window will describe the serial port preferences required for the Amiga. 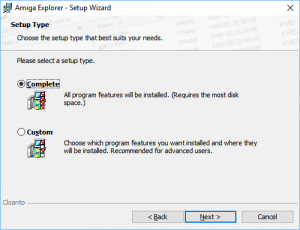 Once the Amiga Serial Preferences are set, on your Windows PC click on the OK button of the Amiga Explorer Setup dialog. 8. 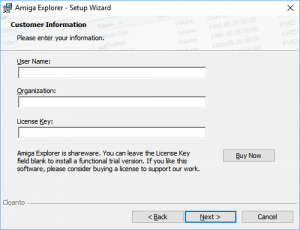 Follow the instructions described on the Amiga Explorer Setup dialog. On the Amiga, open a Shell and type the command “Type SER: to RAM:Setup” and press Enter. 9. 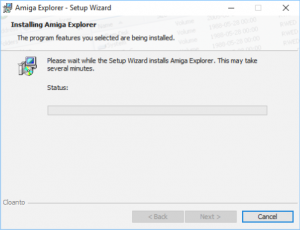 Then on the Windows PC, click on the OK button of the Amiga Explorer Setup dialog and wait while the Setup program for Amiga Explorer is copied to the Amiga’s RAM: drive. 10. Once the copy is complete, as described in the Amiga Explorer Setup dialog, press Ctrl-C on the Amiga. Nothing will appear to happen, that is normal. 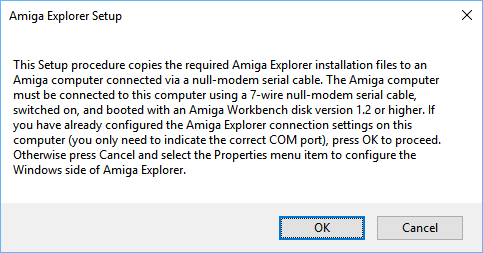 Once you’re pressed Ctrl-C on the Amiga then click OK on the Amiga Explorer Setup dialog of the Windows PC. The word “**BREAK” should appear in the Amiga Shell. 11. As instructed, in the Amiga Shell type “RAM:Setup” and press Return. Then click on the OK button of the Amiga Explorer Setup dialog on the Windows PC. 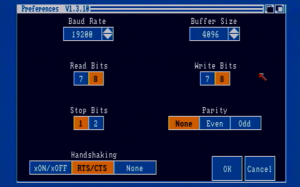 This will start copying the Amiga Explorer application to the RAM Disk of the Amiga. 12. 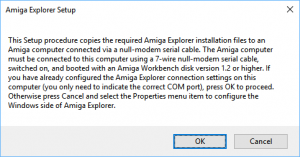 Once the copy of the Amiga Explorer application to the Amiga’s RAM Disk is complete, click OK on the Amiga Explorer Setup dialog on the Windows PC. That’s it! 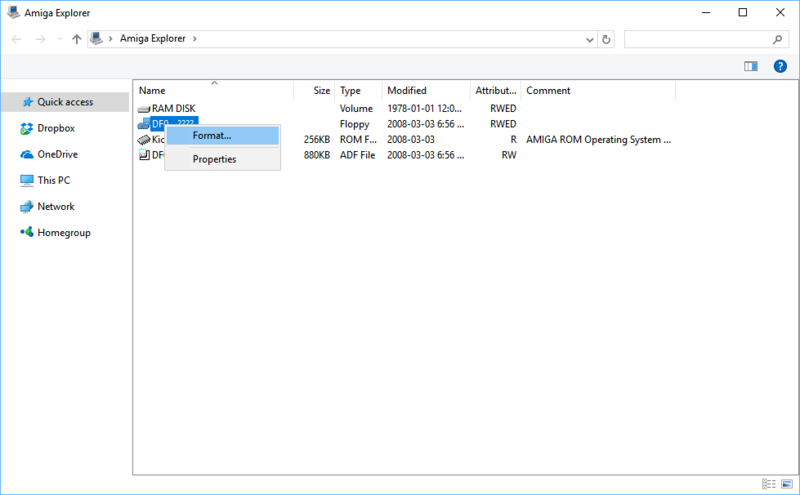 The Amiga Explorer application is now located in the Amiga’s RAM DISK. Feel free to either leave it there if you’re only using it temporarily, or copy to a floppy if you need a more convenient way to start it in the future. 1. 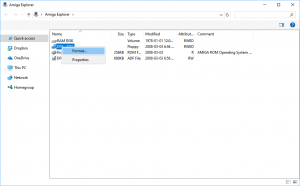 To start or stop the Amiga Explorer application on the Amiga, open the RAM DISK (or wherever you’ve copied the Amiga Explorer application to) and double-click on the AEplorer icon. 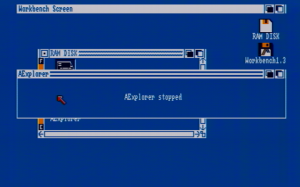 When you launch the Amiga Explorer application on the Amiga, an AExplorer window will appear showing the connection information. This windows will appear for only a few seconds and then it will disappear. To close the Amiga Explorer application on the Amiga, double-click on the AExplore icon again. When you close the Amiga Explorer Application on the Amiga another AExplore window will appear indicating that it’s stopped. 2. 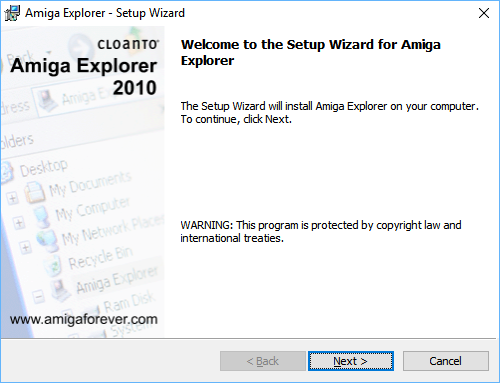 Once the Amiga Explorer application is running on the Amiga, launch the Amiga Explorer application on Windows. 3. 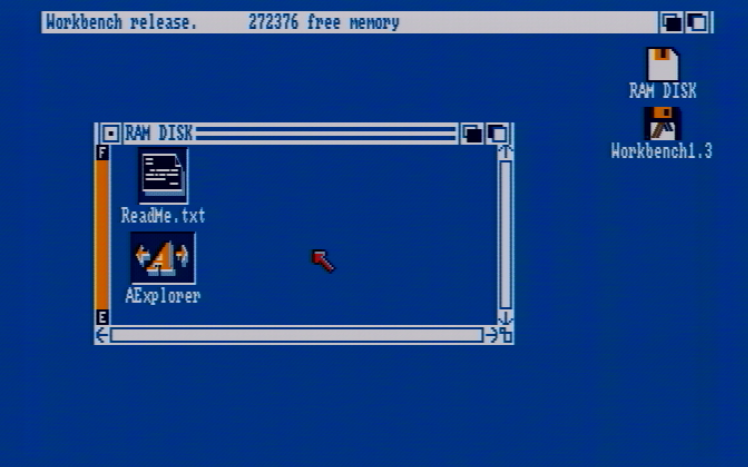 Below is what the main Amiga Explorer window looks like. Navigate the RAM DISK, hard disks, and any floppies inserted into the drives by double clicking their symbol. 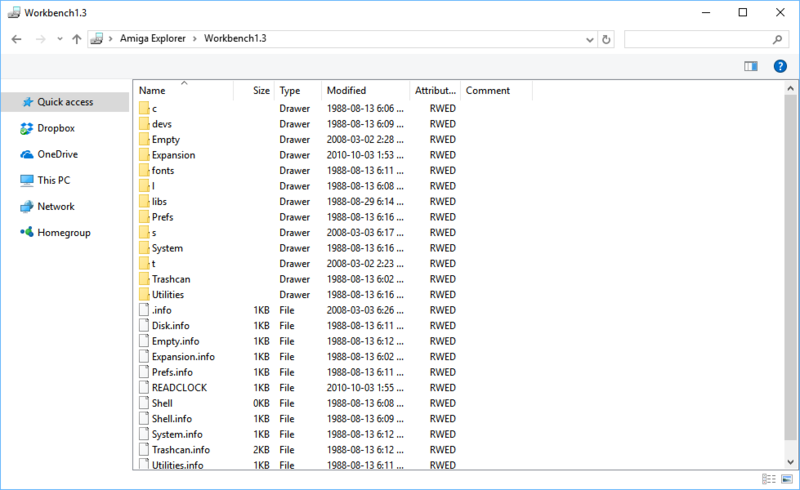 The example to the right shows me navigating the Workbench 1.3.3 floppy. 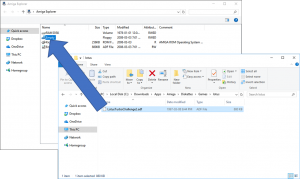 Copy Amiga Disk Format (ADF) images to a floppy inserted in the Amiga’s drive by dragging and dropping the ADF file from your Windows PC to the Amiga floppy symbol. 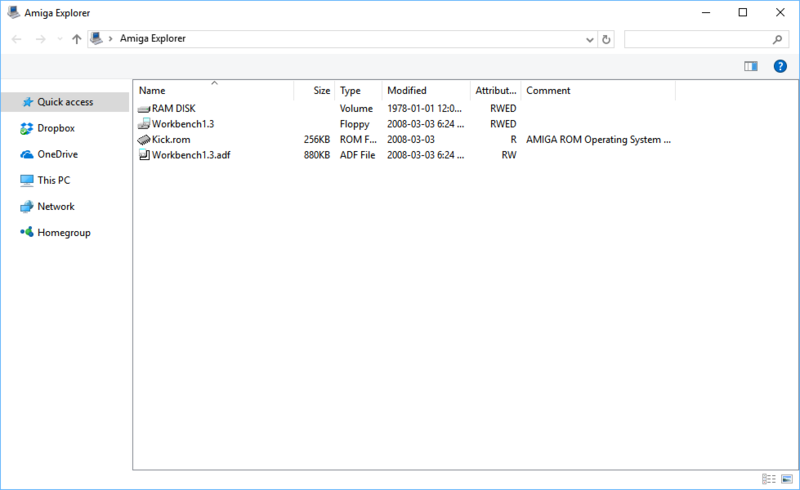 In a similar but reverse fashion, create Amiga Disk Format (ADF) images for floppies that are inserted in the Amiga’s drives by dragging the ADF file symbol to somewhere on your Windows PC. 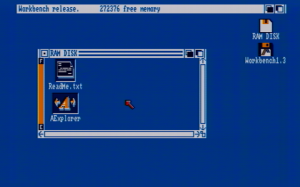 Format floppies that are inserted in the Amiga’s drives by right-clicking on disk symbol and selecting format from the pop-up menu. (NOTE: This function requires Workbench 2.0 or higher). 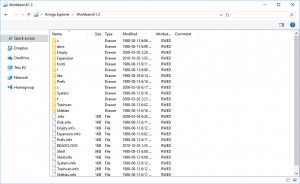 Copy the Kickstart ROM from your Amiga to your Windows PC by dragging the Kickstart ROM symbol to somewhere on your Windows PC. 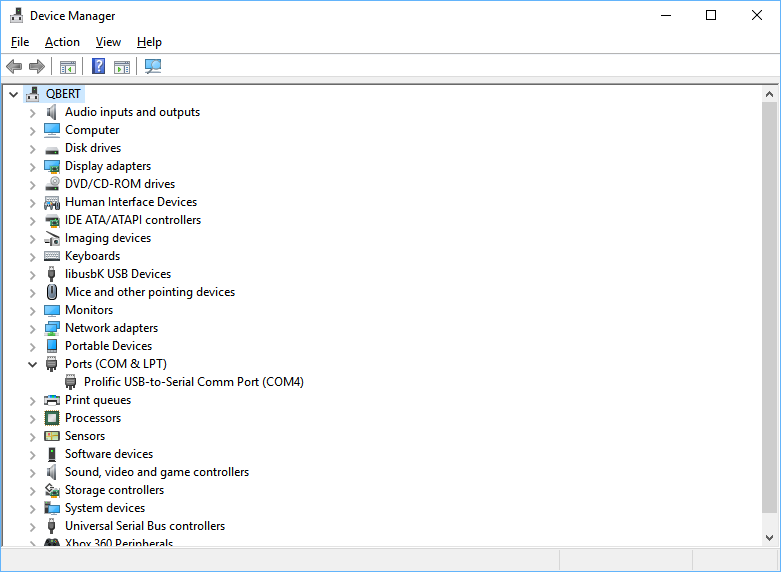 There are probably a bunch of other functions part of Amiga Explorer, but those will probably be the main ones most will use. I have some ADF files of some stuff I programmed years back and would love to get them to run on a real Amiga. 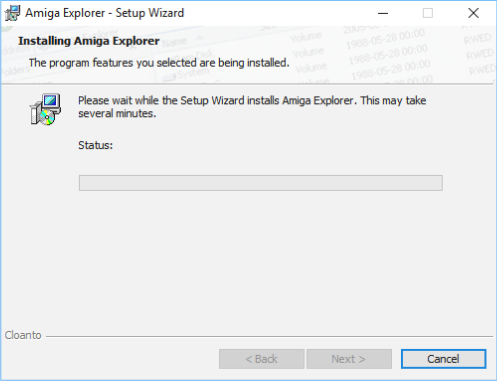 Tried setting up Amiga Explorer without success. Everything checks out fine until I run setup. 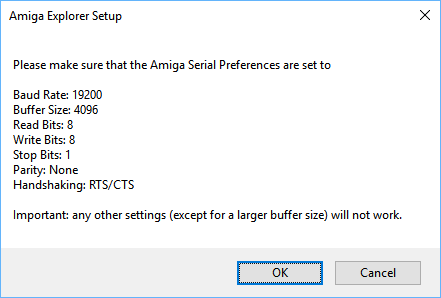 The Amiga takes the command “Type SER: to RAM:Setup”, setup seems to transfer, I hit Ctrl+C but when I hit “OK” on the PC side, I don’t see the “**BREAK” message. Quadruple checked my cable. Any suggestions? Strange. Try opening up a new Shell and continue with step 11. Perhaps the setup has copied successfully and the original Shell is just not recognizing the copy has completed. I tried that as well. I also checked RAMDisk to see if the file was there and it was not. I wonder if it has to do with how I jumpered the connectors. On the connections that lead from one to two contacts, I used a small bit of wire to bridge the two connectors. Should I have split the wire braids in half and run each half to the two connectors? Continuity checks out fine on those connections, 1&6 on DB9 to 20 on DB25 and 4 on DB9 to 6&8 on DB25. Would you know of an off the shelf cable that works with AE? If I can test it with a known working cable then I can move on to troubleshooting the serial port itself. Thanks for the reply Jason! Using a small bit of wire is what I did on my cable too, so what you’ve described sounds like it should be okay. From what it says on Cloanto’s web page for Amiga Explorer about the cable is an off the shelf cable should work if it supports full handshaking. 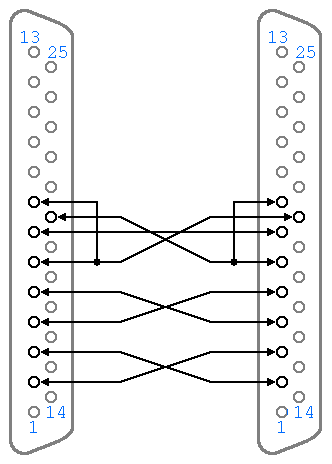 Would you be able to take a picture of the cable you made showing both ends? And send it to jason(at)everythingamiga.com? I’m out of town at until the end of the week for work but when I get back I’ll do a bit of testing to see if I can offer some other ideas to confirm the cable is working okay. But if you can send me a picture or two that will at least get me started. Alright Jason, I reworked the cable entirely and same issue. Until… I tried holding the Ctrl+C combo for ten seconds! **BREAK! Well, at least I was able to make the new cable more substantial and pretty. Thanks for the help! That’s wonderful that it worked for you! Strange about having to hold down Ctrl+C. I’m glad you got it sorted.